Early in the spring we noticed aphids on our pea plants in the hoop house. We found praying mantis eggs near the blueberries and pulled a few, carrying them inside by the peas. 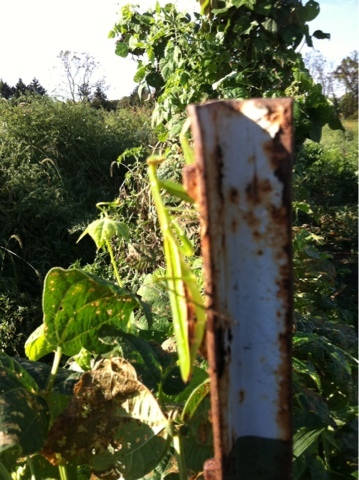 Ended up with a bumper crop of peas and teeny tiny praying mantis babies all over. Now they are large. I've heard that they nocturnal and carnivorous...but bats and birds will eat them. And they will indeed eat each other. As a kid I can remember being told by other kids that it was illegal to kill a praying mantis...a while it seems a great idea to leave this wonderful bug alone there do not appear to be any actual laws protecting them. We try and keep them away from chickens, because the birds will eat them right up. Such a cool looking bug and so good for vegetable growing, as they eat many pests. Our messy farm let's the eggs be all winter so that we can enjoy them during the warm months.